Like me, you might have a 500GB PS4. While 500GB seems fine at first, it is woefully inadequate for most of today’s games. If you found this to be the case, Sony has thankfully allowed customers to upgrade their hard drives themselves without voiding warranty. To help anyone else wanting to upgrade their storage, I’ve created a few quick and easy steps below to speed up the process. Buy a replacement hard drive. PS4 hard drives are 2.5 inch laptop hard drives. Almost any drive will do as long as it can fit into the caddy. The drive that comes with the original PS4 is a 500GB 5400 RPM SATA II hard drive. In order to replace it, you will want to choose another laptop hard drive of 1 or 2 TB. The only limitation you have is the thickness of the 9.5 mm caddy. While the original HD is 5400 RPM it is possible to replace it with a faster drive, however some users have reported the excess heat and power consumption of quicker drives may cause additional wear and tear to your PS4 so definitely use at your own risk. I opted for a Seagate ST2000LM003 2TB 2.5 SATA 6GB/s which cost $165.00AU at Umart. The next thing is to backup your save games. For me I grabbed a flash drive and did an archive of my settings and save games from the system menu. For later steps, it’s easier if you use a FAT32 formatted drive. It is possible to backup your game installs, patches and digital downloads but this will take a bigger USB storage device and will take a lot of time. To initialise your new drive you will need to put the PS4 OS files on a flash drive. Make sure your drive is formatted to FAT32. Download the PS4UPDATE.PUP file from the PlayStation website. Make sure the file is 850MB. The download link is at the bottom of the page so you might have to do some searching. Also, make sure you grab the file from your region as my experience seems to show that the US file will not work on Australian PS4. (For Australia, you can get the file from this page: https://www.playstation.com/en-au/get-help/ps4-system-software/) Put the file in the location X:\PS4\UPDATE\PS4UPDATE.PUP on your USB drive. 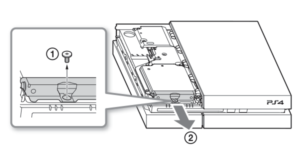 Turn off the PS4, unplug the power cord and remove the outer casing. 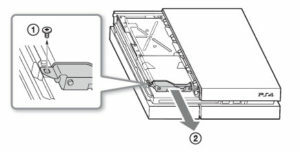 Remove the screw holding in the hard drive caddy and slide the caddy out. Remove the 4 screws holding in the hard drive and remove the hard drive. Replace the hard drive with the new one, replace all 4 screws, slide the caddy back into the PS4. After this, replace the remaining screw and replace the outer casing. *Diagram’s taken form the official playstation website. Insert the USB stick with the update file and start the PS4 in safe mode. To start the PS4 in safe mode, press the power button for aproximately 7 seconds. Once you see a menu, choose option 7, Initislise PS4 (Reinstall system software). Reinstall your games, patches and apps if needed. Play your your newly upgraded PS4!